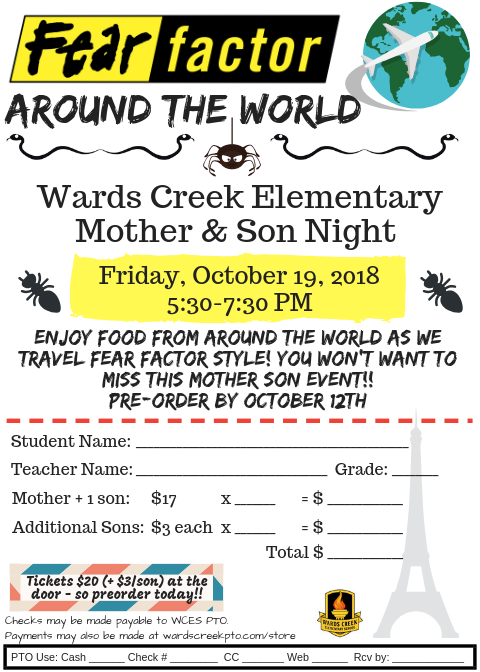 WARDS CREEK ELEMENTARY PTO - Latest News! The PTO board for next year has been slated, but we still have some openings and we need your help!! The following positions are open and waiting for you! Please email wardscreekpto@gmail.com to chat with us about the position you might be interested in. It's the time of year - time to apply to join the Wards Creek PTO Executive Board! You can check out the positions open and read more about each job by visiting this document. ​There are eleven positions for election: President, 1st Vice President, 2nd Vice President, Treasurer, Recording Secretary, Corresponding Secretary, Parliamentarian, Business Partner Liaison, Volunteer Coordinator, Room Parent Liaison and SAC (School Advisory Committee) Liaison. Applications can be downloaded here. They must be submitted to the school in a sealed envelope labeled ATTN: PTO Slate Committee. Applications are due by February 22, 2019 at 6 PM. If you are interested in serving for the upcoming school year, please consider applying to join the board! ​Also an important note - list all of the job roles you'd consider serving in. This is a wonderful opportunity to serve the school and we're not going to lie - we have a good time on the PTO Board :) You will make some amazing friends & have an inside view of all the hard work that it takes to make a successful PTO! We might be biased, but it's a great volunteer job! 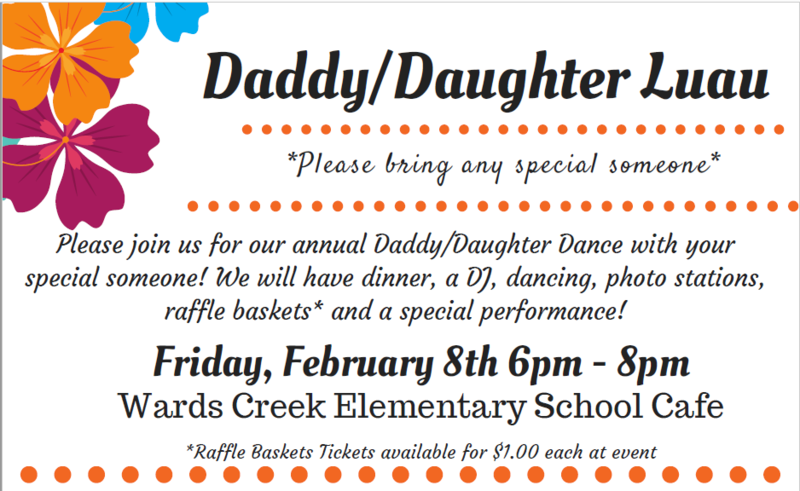 It's time for that world famous Daddy Daughter Dance!!! Pre-order tickets are on sale now through Friday, February 1st. You can send the form to school with check (written to WCES PTO) or cash or you can purchase tickets in our online store. If you've been at WCES for a while, you may be used to a different fundraiser. We thought we'd mix it up a little bit this year and we are EXCITED to announce our 2018-2019 fundraiser: The Move & Groove-a-Thon!! This is everything you need to know about the fundraiser. Get started by visiting http://www.99pledges.com/fund/moveandgro/addme to create your own personalized fundraising page. Your child will receive a copy of a pledge form to help keep track of their fundraising efforts. They can ask for sponsors for the dance-a-thon either per minute that they participate (we will be dancing 30 minutes) or a flat pledge donation. We accept payment online at their personalized link, cash, or check written to WCES PTO. Create your page, tell your friends and family, and let's get groovy! Why: To raise funds for water bottle filling stations, classroom technology, and community support. ** The highest earner in the school will win their choice of an Xbox, PlayStation, or Nintendo and Just Dance!!! * If the school meets the $20,000 goal, Mrs. Mitidieri & Mr. Klein will EAT WORMS!!!! * The first class to have 100% of the class with an online pledge page gets a cookie party!! Our goal is $20,000 this will allow us to retrofit the water fountains in the school, buy filters for them, and provide some much needed tech enhancements in the classrooms (such as new/updated smart board technology). A portion of the funds raised will also go towards the Nease Souperbowl, which benefits Blessings in a Backpack - a food outreach program for children in need in St. John's County (including at WCES). Keep the germs away with fresh water from a fountain like this below. You hold your water bottle in front of the picture of the water bottle and you get nice, filtered water!! We appreciate your support! Community, family, and friends like you are what makes Wards Creek such a special place to send our children!! PS: Did you know that WCES PTO is a 501(c)3 charity? This means your contribution may be tax deductible!! Double bonus!! Greetings PTO Members! The Wards Creek Elementary School Parent Teacher Organization (PTO) is currently recruiting members for this year’s slating committee. What’s a slating committee, you ask? In a nutshell, every year the PTO Board is made up of volunteers (both parents & teachers/staff) who apply for a board position. In order to streamline the election process, our bylaws state that a slating/nominations committee helps read applications for board positions and recommends one person for each position. Here’s how the whole process works. Step 1: A slating (nominations) committee is formed with a minimum of 5 members - at least 2 (outgoing) board members and 3 current PTO Members make up the board. The current PTO Board will choose the members of the slating committee from a pool of applicants. Step 2: A call for applications is made – anyone interested in serving on the PTO Board next year is asked to submit an application. Step 3: During the month of February, the slating committee meets to review applications for Board positions. Step 4: At the March general PTO membership meeting, the slating committee officially recommends 1 applicant per position for next year’s PTO Board. Step 5: At the April general PTO Membership meeting, these applicants are voted on by the general PTO membership. At that time, any person who was not slated for a position, but desires to run, may be nominated from the floor to run against a slated position. Step 6: In the month of May, all board members voted in by the general PTO membership enter into a month of transition with the current board. At the end of the school year, the new board takes over and starts planning for next year! If you are interested in serving on the PTO Slating (Nominations) Committee to help with the 2019-2020 PTO Board Member elections, please use this form to apply by 12 noon on Wednesday, January 29, 2018. You must be a member in good standing (remember when you joined PTO at the beginning of the school year and got that handy dandy discount card?? That means you're a member with currently paid dues! If you're not sure, you can always email us to ask....) You must also not be planning to run for a board position this year. Serving on the slating committee will generally entail 1 (possibly 2) afternoon or evening meetings (depending on committee member availability) during the month of February. It is a very small time commitment. 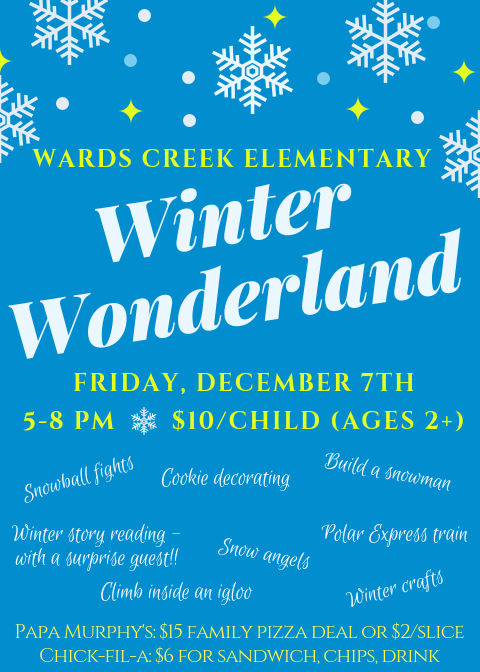 If you have any questions, please feel free to contact us at WardsCreekPTO@gmail.com. Thank you for your continued support of the PTO and we appreciate your willingness to serve! Join us for our NEWEST event -- Winter Wonderland!!!! We are so excited to share winter with you, Florida style!! What does this get you?? SNOW!!!! Snowball fights, a snowman building station, snow angels... oh yeah we are serious!!! There will also be a polar express train, winter story reading, igloos, crafts, and more!! We hope you will join us. You can purchase tickets in advance to skip the long line at the door. Visit our store or download the form to send in with cash or check. You can also pre-order dinner for the family - $15 for a large Papa Murphy's pizza and drinks for the whole crew. We will also sell individual slices of pizza and Chick-fil-a meals the night of the event. We are so excited and hope you'll join us for some wintry fun!! The new spirit wear is here!! New for 2018, we have dark heather gray zip up hooded sweatshirts with the Wards Creek logo on the back and WCES on the left front breast. These sweatshirts are high quality and super comfy - you're going to want one for when the weather gets cooler!! You can pick up your sweatshirt TONIGHT at McTeacher Spirit Night or if you miss them tonight (most likely to sell out this evening...) place your order for delivery using our web store or return this form to your child's teacher. Mark your calendars for Tuesday night!! One of our favorite nights of the year - McTeacher Night!! 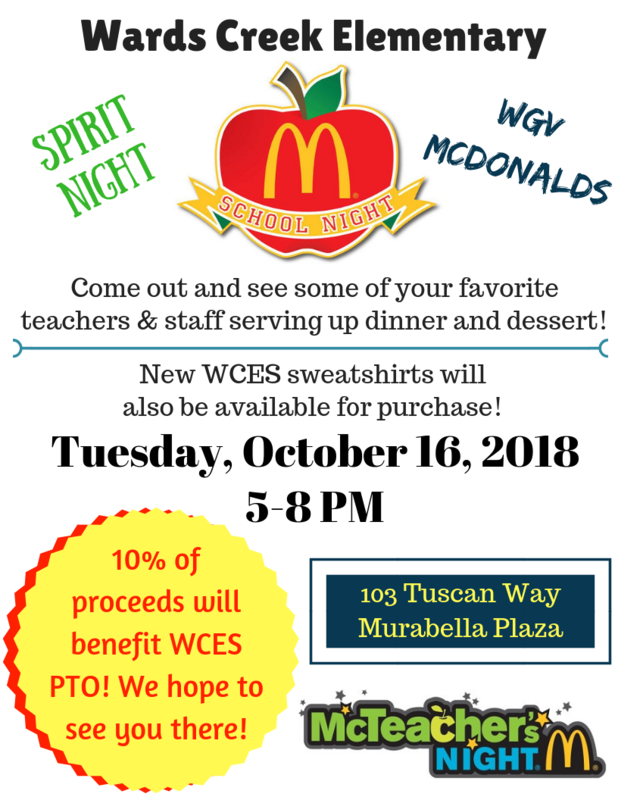 Join us at the Murabella McDonald's from 5-8 to see your favorite WCES Teachers/Staff Members serving up dinner! Also, we will be debuting new fall spirit wear (zip up hoodies, anyone?! ), so bring your wallet! We will have some on hand for you to take home - they are SO warm and cozy, you'll want to have one for the fall!! ​A portion of food sales go to support our school so we hope you'll join us!! Due to some late requests for shirts, we will be placing one final order for shirts. (This includes 5th grade shirts!!) If you still need a shirt, this is absolutely the last order of the year. Please note, we do not have any additional 5th grade shirts in stock, so if you ordered the wrong size or wanted an extra, this will be the only way to get the shirt you need!! Late order shirts will ONLY be available via the web store - click here to order. Shirts are $15 due to the fact that we are outside of our normal ordering period (they cost us more when they are late orders, unfortunately...). All shirt orders that have come in have been filled, so if you did NOT get a shirt and think you should have, now is the time to let us know so we can research it and take care of it!! Thank you! Mother Son Event is coming up!! The 2018 Mother Son Event is coming up!! Take a Fear Factor inspired trip around the world! You'll have food from different countries as you travel activity stations. Join us Friday, October 19 from 5:30-7:30 pm. Tickets are pre-sale or at the door. Pre-sale tickets will be sold until the 12th. You can return the form that will come home from school, download it here, or pay online. $17 for mother son ($20 at the door). ​We hope to see you there! !